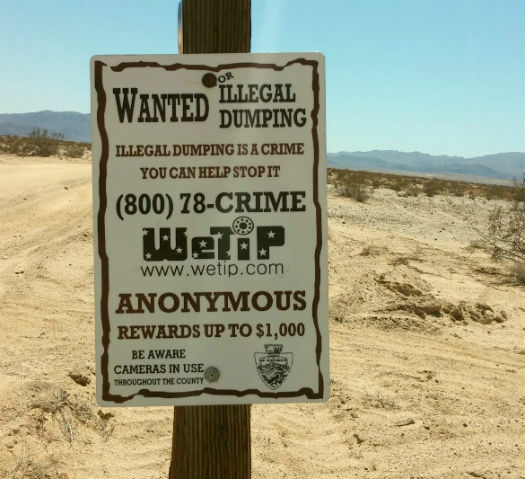 Bob, the most interesting man in Wonder Valley, pointed out a "No Dumping" sign yesterday at Shelton and Amboy. Boy, he has good eyes. I'd never seen it, but they I rarely drive east on Amboy and it seems it's targeted to those drivers. The "We Tip" program seems like a good way for people in Wonder Valley to make a little extra cash. Keep your eyes open and your cameras at hand. Call (800) 782-7463. Information can always be sent directly to the County Sheriff's office Monday through Friday, 8:00 a.m. to 5:00 p.m. at (760) 366-4175, and to the San Bernardino County Code Enforcement at: (909) 387-4044 or (800) 722-3181.